Sometimes we are selfish. We ask 'why' because the word lets us breath, because you cannot say that word and hold your breath - not truly. Perhaps it is selfish to want to keep the ones we love even if they are needed elsewhere. To keep them for the gifts they give to us and not perhaps for them as selves. Today I think it is okay to be selfish, in this one instance. Though it will change nothing. I am drunk with the absence of reason. No amount of rhyme will turn this narrative into logic. Today a dirge is a dirge, a song is something else entirely. It is 5 minutes before a show at the (old) Book Café in Harare. Chi: What do you mean you are afraid of music? Me: Not afraid exactly, I mean I love music who doesn’t. Just as long as it’s not me singing right? 15minutes later she calls for me on stage. The band is Chikwata 263 and they are in full swing theres no telling them to slow-down for the tenderfoot. She’s one with the mbira or was it the hosho (and if you know Chi you know that she's here but she's somewhere else too) and seeing as I’m the goofball now standing in front of the only microphone in the room with a room full of people waiting for me to do something, I close my eyes, take a deep breath and follow her lead. The result not quite a song but she is so happy. Two years later and I’m still smiling, laughing. Even today. Despite yesterday. 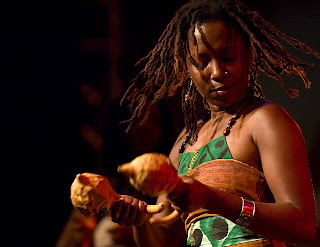 Yesterday Chiwoniso Maraire died. She was 37 years old, only. Here we say o tlhokafetse which loosely translates to, "she was looked for but could not be found." She was beautiful and more than a little good-crazy. She played transcendently, and she told stories like the voices of a million mothers. Had this close-mouthed, hesitant, little girl smile that contradicted the wisdom you heard every time she took the mbira in her hands and made it rain, or the one time she stood still mid-way through a Poetry Africa excursion in Johannesburg and spoke to me about her children. She was young but she’d lived hard, packed a lot into three decades. A handful of people, few and far in-between, have taught me to take my craft but not myself too seriously. As a person I really, really liked her. She’s not gone, we just have to stand still long enough, listen hard enough to hear her.